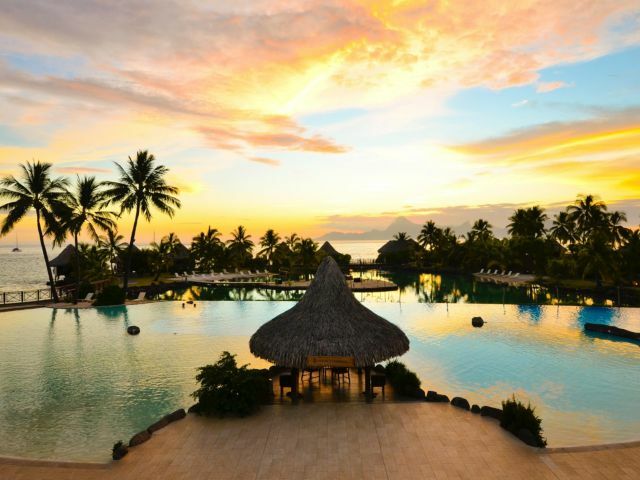 Escape to the islands of Tahiti and discover the captivating paradise! A great choice for weddings, honeymoon- Tahiti offers the perfect backdrop for romance with remarkable snorkeling in Moorea and private island seclusion and romance in Bora Bora. Wherever your passions lie, luxury Tahiti awaits. Arrive in Papeete airport. VIP meet/greet service with private sedan transfer to hotel. Guests will be met by a private greeter. They will be given a deluxe lei greeting and escorted to their vehicle where they will receive a pre-moistened cold towel and chilled bottled water. Includes luggage handling & assistance. Check into InterContinental Tahiti. Encounter wild dolphins and whales on an informative eco-tour led by marine biologist Dr. Michael Poole and his research team. You`ll watch for these magnificent creatures and learn all about them in the process. You`ll also stop for a relaxing snorkeling session in Moorea`s translucent lagoon. .
Moorea is green with plenty to do- you'll scuba, snorkel, enjoy your beach bungalow and more! Transfer to the island of Moorea by boat. Check into the Moorea Pearl Resort Hotel Located on the north shore of Moorea, just east of Cook’s Bay, this resort offers a quiet retreat amid 7.5 acres of landscaped grounds and a curving, white-sand beach. In addition to two restaurants and a bar, the resort features a full-service spa inspired by the ancient traditions of Polynesian well-being. Massages and other treatments incorporate time-honored techniques and oils and extracts from indigenous plants, while a steam bath, Vichy shower, and full-body shower room add a European touch. Guests also have access to an outdoor swimming pool, private beach with water-sports equipment. Garden Pool Bungalow - Bungalow with double bed and sitting area. Private terrace or sundeck with private pool. Ceiling fan, air conditioning, minibar, coffee and tea making facilities, telephone, and television with video channel, shower, and in-room safe. Discover Moorea`s volcanic peaks, crystalline waters and lush hillsides on an adventurous Jeep Safari tour. Traverse and explore Moorea’s “Magic Mountain,” the “Belvedere Lookout”, Opunohu Bay and Cooks Bay. Visit the Agricultural College where you'll discover a variety of plants native to these Polynesian islands. You'll also stop at a pineapple plantation and visit the juice factory. Drive to the Belvedere look-out point and the ancient Polynesian sites to view the most spectacular part of the island with its breathtaking view of both Cooks and Opunohu Bays. Venture inland to visit pineapple plantations. Sample fine tropical fruit liqueur and fruit at factory/distillery. 4 Nights in Bora Bora at the Intercontinental La Moana might be the most relaxing memories you take home. The overwater bungalow is an amazing experience! Take an Inter Island flight from Moorea, and a Waterferry from airport to hotel. Even the transfer to this hotel is amazing; your small boat is a quiet and private tour of the island. Over-water villa offers guests 1023 square feet. Living rooms include glass-bottomed coffee tables, illuminated at night, for viewing the ocean life below. Terraces include lounges and dining tables and a fresh water shower on the sundeck; bathrooms are bright and open onto the lagoon. Bedrooms have separate walk-in dressing rooms. Enjoy dinner at the famous Bloody Mary's on the beautiful island of Bora Bora. Famous for its intriguing dinner format. As you enter the building, the white sand between your toes and the thatched roof sets the tone. Head to the fish stand where the fresh catches of the day are displayed on ice and you choose the fish or combination you desire. A feast fit for a king. Includes hotel transfers. Explore the unspoiled coral reef and underwater life in Bora Bora. A covered boat will transfer you across the lagoon near the barrier reef where ideal conditions have encouraged maximum growth. After you explore the reef for a while, your guide will attract some "black tipped" sharks with bait and feed these graceful creatures. An experience not to be missed.